When a cell divides, its constituents are usually evenly distributed among the daughter cells. 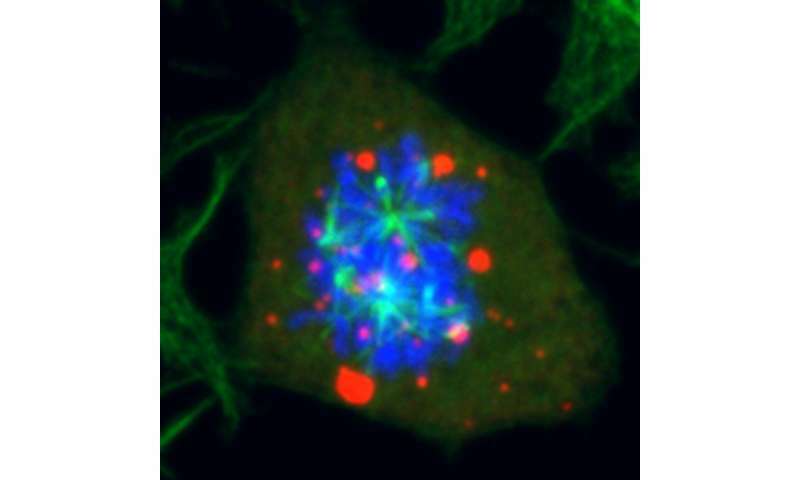 University of Zurich researchers have now identified an enzyme that guarantees that cell constituents that are concentrated in organelles without a membrane are properly distributed. Their discovery opens up new opportunities for the treatment of cancer, neurodegenerative diseases, aging processes and viral infections. As every cook has experienced: When balsamic vinegar and olive oil are mixed, both liquids separate. Round vinegar drops form, which then float on the surface of the oil. In physical terms, this constitutes the formation of two phases in the liquid. Phase separation of molecules also takes place inside cells. Here, liquid drops form in the cell plasma. Researchers at the laboratory of Lucas Pelkmans, professor at the Institute of Molecular Life Sciences at the University of Zurich (UZH), have now discovered that a class of enzymes – which are dual specificity kinases – actively control this process in cells. When a cell divides, the enzyme DYRK3 promotes the mixing of the phases. This guarantees that the cells can correctly build the machinery for separating the chromosomes and dividing the cell content. After division, the enzyme is broken down and the individual phases start to form again. If everything goes according to plan, the genetic material, organelles and cell contents are correctly distributed among the daughter cells. "These fundamental findings give us completely new insights into cell division: as a process in which the cell contents mix together and then separate again," says Lucas Pelkmans. The knowledge that this physico-chemical process in cells is actively regulated by enzymes is highly relevant to the research into and treatment of various wide-spread diseases. 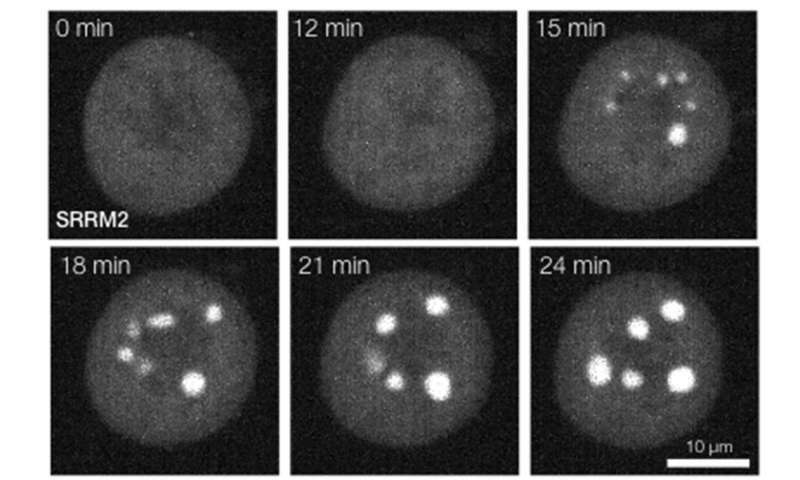 If phase separation during cell division does not work properly, the separation of the chromosomes is incomplete and they are then incorrectly distributed to the daughter cells – a significant characteristic of numerous kinds of cancer. Many protein defects that possibly cause neurodegenerative problems are also presumably the consequence of a failed intracellular phase separation. "Thanks to the discovery as to which proteins control phase separation, new strategies can be pursued to prevent mistakes in this process," says Pelkmans. Both the distribution of the cell contents across the daughter cells and the specific retention of "old" components in a cell are important processes in aging. In this case, as well, a finely controlled mixing and separating of phases is an important process that determines the fate of cells. A further possible application would be viral infections: When viruses infect cells, they often trigger the phase separation of molecules. In this way, they create isolated areas in which new viruses can form. Viral infections are also the original of the discovery of the UZH scientists. "Since we now know that these enzymes control intracellular phase separation during viral infections, we can research new antiviral therapies," says Pelkmans.